Online ordering menu for Villa Vinci. 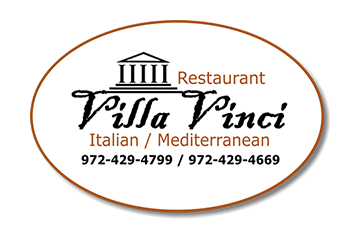 Villa Vinci is a family restaurant serving the Wylie, TX area. We serve authentic Italian cuisine, made fresh using only the finest ingredients. From our delicious handmade pizzas to our pasta specials, you and your family are sure to enjoy at our restaurant. We believe that our customers are our number one asset. Our restaurant has a warm atmosphere, our prices are right and the food will want you to keep coming back. Located on Marble St and Ballard Ave, two blocks north of 78 Hwy.